I first came across Lisa Ross' arresting images of her journeys along the holy places of the Taklamakan desert in Steppe Magazine's 2008 summer issue. New Yorkers are lucky that the Rubin Museum of Art is showcasing her photographs of mazars in the remote deserts of Xinjiang in western China. The exhibition, titled Living Shrines of Uyghur China, runs until 8 July. Mazar, which literally means ‘a place for visit’ or ‘place of paying homage’, is a Sufi shrine, adorned with small devotional offerings that mark a prayer or visit. Muslim saints, Sufi poets or healers may be buried there. Or perhaps the mazar marks a holy person's stopping or resting spot. 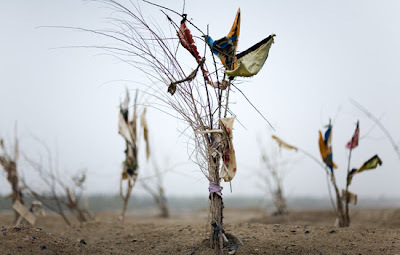 Uyghur pilgrims have visited the mazars of the Taklamakan desert for over ten centuries, decorating the shrines with ornaments, fabric, amulets, mirrors etc as they prayed. 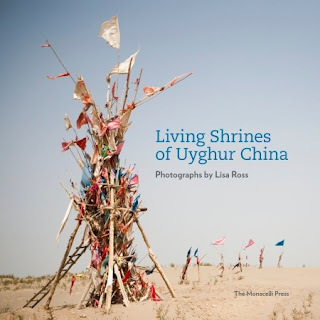 Ms. Ross spent over 8 years exploring the area with assistance from Uyghur ethnographer Rahile Dawut and French historian Alexandre Papas. Her photographs are astonishing, respectful and lyrical. Most sites are not identified, not just because of the sensitivity of the area, but also to protect the sites. If you are unable to visit the museum, you can share Ms. Ross' experience of the desert by viewing the photographs at her online gallery, where you can also purchase a copy of the book.